Basel, November 21, 2014 - Novartis announced today that the Committee for Medicinal Products for Human Use (CHMP) has adopted a positive opinion recommending approval of Cosentyx(TM) (secukinumab, formerly known as AIN457) as a first-line systemic* treatment of moderate-to-severe plaque psoriasis in adults who are candidates for systemic* therapy. This recommendation would mean doctors could use secukinumab first-line to treat their psoriasis patients, as an alternative to other first-line systemic treatments, which have significant side effects. Currently, all biologic treatments for psoriasis, including anti- tumor necrosis factor therapies (anti-TNFs) and ustekinumab are recommended for second-line systemic therapy in Europe-. Secukinumab (at a dose of 300 mg) is the first interleukin-17A (IL-17A) inhibitor to be recommended as a first-line treatment option for psoriasis patients who require systemic therapy in Europe. Secukinumab works by inhibiting the action of IL-17A, a protein that is found in high concentrations in skin affected by the disease-. "This positive CHMP opinion for secukinumab as a first-line treatment of psoriasis brings us one step closer to approval in Europe and making clear skin a reality for psoriasis patients," said David Epstein, Division Head, Novartis Pharmaceuticals. "With this exciting news, we may change the way psoriasis is treated, as 50% of patients are unhappy with their current psoriasis therapies, demonstrating an urgent need for new treatments that clear skin faster and for a longer time." The ultimate aim of psoriasis treatment is clear skin for patients. In clinical studies, 70% or more patients achieved clear skin (PASI 100) or almost clear skin (PASI 90) with secukinumab 300 mg during the first 16 weeks of treatment,. The CHMP opinion was based on the positive results of the Phase III clinical trial program in moderate-to-severe plaque psoriasis and follows the unanimous recommendation of approval in October from the Dermatologic and Ophthalmic Drugs Advisory Committee (DODAC) to the US Food and Drug Administration (FDA)-,. In these trials, secukinumab consistently demonstrated very high skin clearance, including superiority to Enbrel®** (etanercept) in the head-to-head FIXTURE study-,. 70% or more secukinumab 300 mg patients achieved clear skin (PASI 100) or almost clear skin (PASI 90) during the first 16 weeks of treatment in the FIXTURE and ERASURE studies; this was maintained in the majority of patients up to Week 52 (with continued treatment)-,. Secukinumab patients in the FIXTURE, ERASURE, FEATURE and JUNCTURE studies (reviewed by the US FDA) also observed significant differences as early as Week 2 and on average, secukinumab 300 mg patients had symptoms reduced by 50% by Week 3, compared to Week 7 for Enbrel®** (etanercept) patients, in FIXTURE-,. Secukinumab demonstrated a favorable safety profile, with similar incidence and severity of adverse events between secukinumab treatment arms (300 mg and 150 mg)-,. The European Commission reviews the recommendations of the CHMP. The final decision on approval, usually granted in approximately two months of the CHMP opinion, will be applicable to all European Union (EU) and European Economic Area (EEA) countries. Psoriasis is a chronic autoimmune disease characterized by thick and extensive skin lesions, called plaques, known to cause itching, scaling and pain; it is associated with significant impairment of physical and psychological quality of life-. Psoriasis affects up to 3% of the world's population, or more than 125 million people. In Europe, the estimate is about 0.8%, which means that plaque psoriasis affects about 3.7 million Europeans, with about 2.4 million considered to have moderate-to-severe disease. This common and distressing condition is not simply a cosmetic problem - even people with very mild symptoms are affected everyday. Furthermore, there is an urgent need for new psoriasis treatments, as up to 50% of patients are not content with current therapies, including biologic treatments,-. Secukinumab is a human monoclonal antibody that selectively neutralizes IL-17A,. IL-17A is found in high concentrations in skin affected by psoriasis and is a preferred target for investigational therapies-. Phase IIIb studies in psoriasis are also ongoing, including the head-to-head CLEAR study of secukinumab versus Stelara®*** in moderate-to-severe plaque psoriasis and studies in palmo-plantar psoriasis, nail psoriasis and palmo-plantar pustulosis. Secukinumab is also in Phase III development for psoriatic arthritis (PsA) and ankylosing spondylitis (AS); regulatory applications for secukinumab in these arthritic conditions are planned for 2015. The foregoing release contains forward-looking statements that can be identified by words such as "positive opinion," "recommended," "recommending," "would," "could," "may," "aim," "will," "investigational," "ongoing," "planned," or similar terms, or by express or implied discussions regarding potential marketing authorizations for Cosentyx, or regarding potential future revenues from Cosentyx. You should not place undue reliance on these statements. Such forward-looking statements are based on the current beliefs and expectations of management regarding future events, and are subject to significant known and unknown risks and uncertainties. Should one or more of these risks or uncertainties materialize, or should underlying assumptions prove incorrect, actual results may vary materially from those set forth in the forward-looking statements. There can be no guarantee that Cosentyx will be submitted in AS or PsA in any market, or approved for any indication, or at any particular time. Nor can there be any guarantee that Cosentyx will be commercially successful in the future. In particular, management's expectations regarding Cosentyx could be affected by, among other things, the uncertainties inherent in research and development, including unexpected clinical trial results and additional analysis of existing clinical data; unexpected regulatory actions or delays or government regulation generally; the company's ability to obtain or maintain proprietary intellectual property protection; general economic and industry conditions; global trends toward health care cost containment, including ongoing pricing pressures; unexpected manufacturing issues, and other risks and factors referred to in Novartis AG's current Form 20-F on file with the US Securities and Exchange Commission. Novartis is providing the information in this press release as of this date and does not undertake any obligation to update any forward-looking statements contained in this press release as a result of new information, future events or otherwise. Novartis provides innovative healthcare solutions that address the evolving needs of patients and societies. Headquartered in Basel, Switzerland, Novartis offers a diversified portfolio to best meet these needs: innovative medicines, eye care, cost-saving generic pharmaceuticals, preventive vaccines, over-the-counter and animal health products. Novartis is the only global company with leading positions in these areas. In 2013, the Group achieved net sales of USD 57.9 billion, while R&D throughout the Group amounted to approximately USD 9.9 billion (USD 9.6 billion excluding impairment and amortization charges). Novartis Group companies employ approximately 133,000 full-time-equivalent associates and sell products in more than 150 countries around the world. For more information, please visit http://www.novartis.com. **Enbrel® is a registered trademark of Amgen Inc.
***Stelara® is a registered trademark of Janssen Biotech, Inc.
 Langley RG, Elewski BE, Lebwohl M, et al. 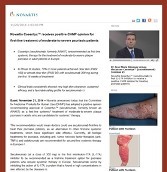 Secukinumab in plaque psoriasis: results of two phase three trials. N Engl J Med. 2014. Jul 9;371(4):326-38..
 Blauvelt A, Prinz J, Gottlieb AB, et al. Secukinumab Administration by Pre-filled Syringe: Efficacy, Safety, and Usability Results from a Randomized Controlled Trial in Psoriasis (FEATURE). Br J Dermatol. 2014; [published online ahead of print August 16, 2014]. Paul C, Lacour JP, Tedremets L, et al. Efficacy, safety, and usability of secukinumab administration by autoinjector/pen in psoriasis: a randomized, controlled trial (JUNCTURE). J Eur Acad Dermatol Venereol. 2014; [published online ahead of print September 22, 2014]. Mohanan S, Ramassamy S, Chandrashekar L et al. A retrospective analysis of combination methotrexate-cyclosporine therapy in moderate-severe psoriasis. Journal of Dermatological Treatment, 2014; 25: 50-53. European Medicines agency website, "Enbrel Summary of Product Characteristics" http://www.ema.europa.eu/docs/en_GB/document_library/EPAR__Product_Information/human/000262/WC500027361.pdf. Accessed November 2014. European Medicines agency website, "Humira Summary of Product Characteristics" http://www.ema.europa.eu/docs/en_GB/document_library/EPAR__Product_Information/human/000481/WC500050870.pdf. Accessed November 2014. European Medicines agency website, "Stelara Summary of Product Characteristics" http://www.ema.europa.eu/docs/en_GB/document_library/EPAR__Product_Information/human/000958/WC500058513.pdf. Accessed November 2014. Gaffen SL. Structure and signaling in the IL-17 receptor family. Nat Rev Immunol. 2009;9(8):556-67. Ivanov S, Linden A. Interleukin-17 as a drug target in human disease. Trends Pharmacol Sci. 2009;30(2):95-103. Kopf M, Bachmann MF, Marsland BJ. Averting inflammation by targeting the cytokine environment. Nat Rev Drug Discov. 2010; 9(9):703-18. Onishi RM, Gaffen SL. Interleukin-17 and its target genes: mechanisms of interleukin-17 function in disease. Immunology. 2010;129(3):311-21. Krueger J, Fretzin S, Suárez-Fariñas M, et al. IL-17A is essential for cell activation and inflammatory gene circuits in subjects with psoriasis. J Allergy Clin Immunol. 2012;130(1):145-154. Johansen C, Usher PA, Kjellerup RB, et al. Characterization of the interleukin-17 isoforms and receptors in lesional psoriatic skin. Brit J Dermatol. 2009;160(2):319-24. Novartis data on file. 2013: Clinical study reports for CAIN457A2302 [ERASURE] ; CAIN457A2303 [FIXTURE] ; CAIN457A2304 [SCULPTURE] ; CAIN457A2307 [JUNCTURE] ; CAIN457A2308 [FEATURE]. Stern RS, Nijsten T, Feldman S, et al. Psoriasis Is Common, Carries a Substantial Burden Even When Not Extensive, and Is Associated with Widespread Treatment Dissatisfaction. J Investig Dermatol Symp. 2004;9(2):136-9.Nestle FO, Kaplan DH, Barker J. Psoriasis. N Engl J Med. 2009; 361(5):496-509. Rapp SR, Feldman SR, Exum ML, Fleischer AB, Jr., Reboussin DM. Psoriasis causes as much disability as other major medical diseases. J Am Acad Dermatol. 1999; 41(3 Pt 1):401-7. Farley E et al. Psoriasis: comorbidities and associations. G Ital Dermatol Venereol. 2011 Feb;146(1):9-15.
 International Federation of Psoriasis Associations (IFPA) World Psoriasis Day website. "About Psoriasis." http://www.worldpsoriasisday.com/web/page.aspx?refid=114. Accessed February 2014. European Federation of Pharmaceutical Industries and Associations (EFPIA) website. "Psoriais." http://www.efpia.eu/diseases/134/59/Psoriasis. Accessed September 2014. Christophers E, Griffiths CEM, Gaitanis G, et al. The unmet treatment need for moderate to severe psoriasis: results of a survey and chart review. J Eur Acad Dermatol Venereol. 2006;20:921-925. Krueger JG, Koo J, Lebwohl M, et al. The impact of psoriasis on quality of life: Results for a 1998 National Psoriasis Foundation patient membership survey. Arch Derm. 2001;137:280-284. Sterry W, Barker J, Boehncke WH, et al. Biological therapies in the systemic management of psoriasis: International Consensus Conference. Br J Dermatol. 2004;151 Suppl 69:3-17.